Online gambling is the biggest source of the losses. 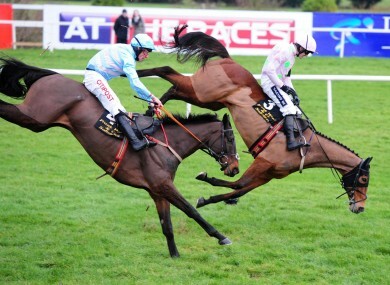 The Arkle Novice Chase at Leopardstown Racecourse last month. IRELAND HAS THE third highest per capita rate of gambling losses in the world. That’s according to research which shows that as a nation we lose about €470 per adult on different forms of gambling. The stats are from last year when gambling losses in Ireland totalled €2.1 billion. The research by industry experts H2 Gambling Capital was published in The Economist this week and showed Ireland behind only Australia and Singapore in gambling terms. About half of the gambling losses in Ireland comes from online with traditional betting the second most popular method. Other gaming outlets such as casinos are less popular in Ireland relative to other markets, like the Unites States which was fifth overall in gambling losses. In the US losses totalled €110 billion with casinos taking the vast majority of that but, as The Economist points out, the country is estimated to have an illegal sports betting market worth €140 billion. On average, Australians had the most severe losses and were down about €930 per person for the year. Most of Australia’s losses comes from gaming machines. The Economist notes that Ireland has only recently passed the US in the gambling stakes after the online market was opened up. Sinn Féin MEP Lynn Boylan says she believes problem gambling is going unreported in Irish society. “While issues around problem drinking and drug abuse have been tackled in a more head on fashion in recent years, the issue of problem gambling has been relatively ignored by politicians,” Boylan says. Email “Irish gamblers are the third biggest losers in the world”. Feedback on “Irish gamblers are the third biggest losers in the world”.